The Indian ambassador to Bhutan, Gautam Bambawale inaugurated two major bridges of Pantang and Rindeygang under Phangkhar Gewog in Zhemgang. The bridges were constructed at the cost of about half a billion Ngultrum provided by the government of India. 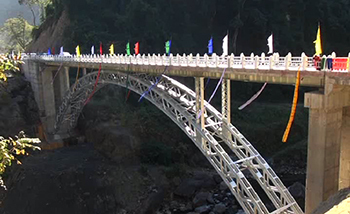 Pantang Bridge over Mangdechu is 128 meters long with a load capacity of 70 tons. The bridge is expected to last for more than one hundred years. The other bridge, Rindeyang, which is about 74.8 metres long, has a load capacity of 40 tons. 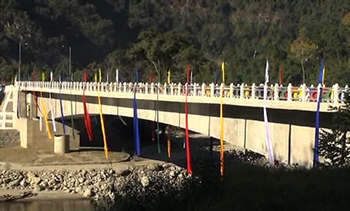 These bridges now connects Gongphu-Panbang highway without much hurdles over big river of Mangdechu and Rindeygangchhu. Gongphu-Pangbang highway now has three major bridges including Dasho Nishoka Bridge which was inaugurated last year by His Majesty the King.